ILSR has long touted the many benefits of composting and amending soil with compost, such as: recovering food waste, enhancing soil fertility and structure, reducing soil erosion and stormwater runoff, cutting landfill methane emissions, and sequestering carbon in soils. Yet few jurisdictions are embracing a diversified composting infrastructure that encompasses, let alone prioritizes developing locally-based capacity over centralized, far-away composting sites. Far-away facilities make it harder to return finished compost back to the community for use. Fortunately, one of the many beauties of composting is that it can be small-scale, large-scale and everything in between. 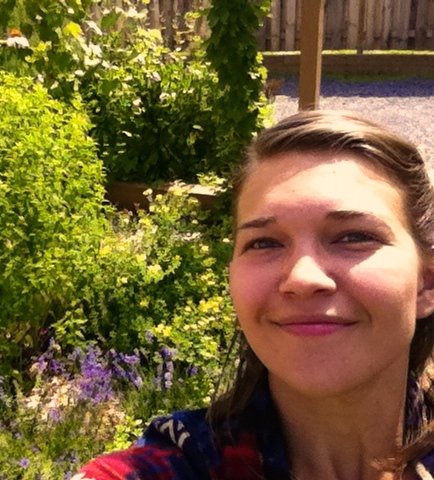 Residents can compost in their backyards. 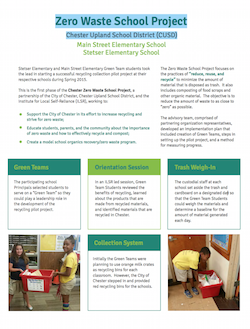 Schools can teach students how to compost and use it for school gardens. Colleges and other institutions can install in-vessel enclosed systems to handle their food wastes. Community gardens and urban farms can connect composting to healthy soil needed for local food production. If implemented, a decentralized approach that combines home and community-scale composting with on-farm and medium-sized operations would create jobs, reduce private and public sector costs for managing waste, and better tie compost to healthy soils and local food production, thereby reinforcing a community culture of sustainability and engaged environmental stewardship. But, even at the small-scale, composting sites required trained operators. It is for this kind of well-managed, diversified resource recovery approach that ILSR’s Composting for Community Project advocates. In 2014, the Composting for Community Project researched, identified and surveyed existing master composter training programs operating around the country. The intention of this outreach was to connect these programs with one another, as well as to glean best practices to develop and launch a model Master Composter and Advanced Master Composter train-the-trainer apprenticeship program in and around the nation’s capital. This initiative is now called the Neighborhood Soil Rebuilders (NSR) Composter Training Program. 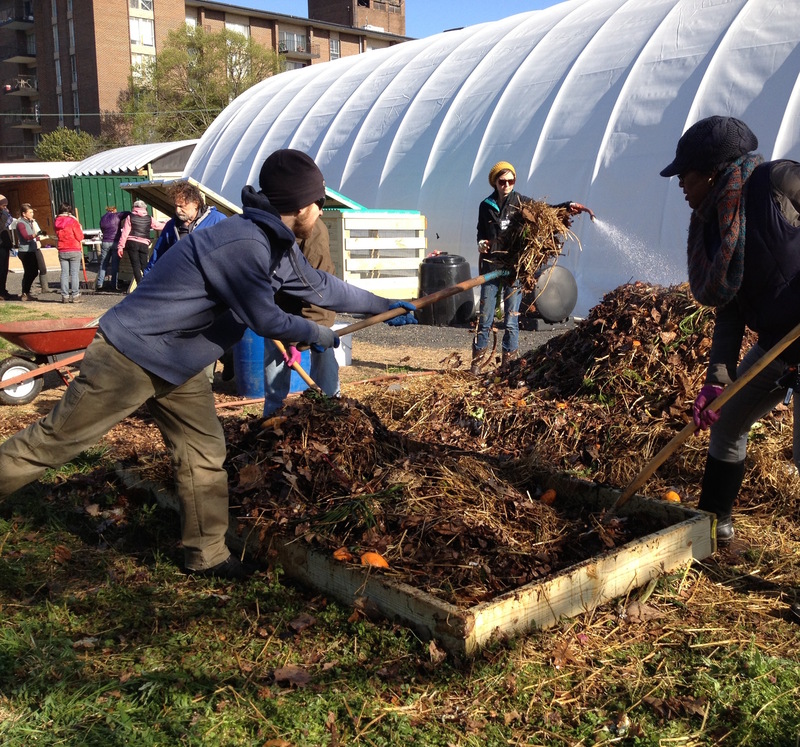 The NSR Composter Training Program, a collaboration with ECO City Farms, aims to increase and improve community-based composting throughout the country by enhancing and expanding Master Composter training programs in metropolitan DC and in select cities nationwide. As of August 2015, we have held a fall 2014 and a spring 2015 Master Composter course, have trained a total of 28 individuals and have supported the implementation of community composting projects throughout the DC metro area. Upon completion of the Advanced Composter course, participants are required to develop a “capstone” project—a project that advances community composting in their neighborhoods—as part of the NSR Advanced Composter program. The different types of capstone projects range from: building and/or operating a two- or three-bin composting system at a community garden to serve as a local organics drop-off composting hub and educational demonstration site in collaboration with ECO City Farms or the DC Department of Parks and Recreation (DPR) Community Compost Cooperative Network; initiating a residential backyard composting program by installing single-bin composting systems at local private residences; developing a condominium vermicomposting system by installing worm bins with fellow apartment dwellers; implementing school composting programs to teach youth composting as well as other core curriculum subjects like math and science, and conducting community events to install composting systems with students, parents, school staff, and environmental clubs; and working with churches and youth-led entrepreneurship to use composting as a “green” job training skill and activity for at-risk youth in crime-ridden, impoverished urban environments. While participants from the spring 2015 course actively delve into their capstone projects and continuous NSR programming will grow the number of project locations, to date, these projects are being implemented at as many as 22 backyard and community level composting sites in the DC Metropolitan Area. All capstone projects involve teamwork as NSR participants champion the development of community composting by recruiting support from neighborhood citizens, school faculty and staff, business owners, government officials, church clergy and parishioners, and others. These capstone projects consist of teams led by a single NSR as well as NSRs that are partnering to co-lead a project. In sum, the fall 2014 Advanced Composter class has conducted approximately 123 community engagement activities thus far, reaching a total of 1,562 community members. Through hands-on composting activities and bin builds, capstone project development, and community-composting education and advocacy, NSRs completed approximately 635 hours of community service benefiting the National Capital Region. A hearty thanks to the Ittleson Foundation, the City Fund, the Town Creek Foundation, the Marisla Foundation, the New York Community Trust, the V. Kann Rasmussen Foundation, the 11th Hour Project, and the Mead Foundation for their generous support of the Neighborhood Soil Rebuilder composter training program!